Germany, Hanau-Lichtenberg. Philipp V, AD 1570 to 1599 (dated 1589). Silver 1/2 batzen. Size : 18.7 x 19.8 mm. Weight : 1.12 grams. Grade : VF with typical weak areas. Obverse : Arms with the date 89 flanking in the small indents to the sides, with PHI O A HANAV D I LIC EOC around. Reverse : Globus cruseger with the denomination mark 2 in the center (2 kreuzer = 1/2 Batzen), with RVDOL Z IMP AVG P F DEC around (citing Rudolf as Holy Roman Emperor). Germany, Cologne. 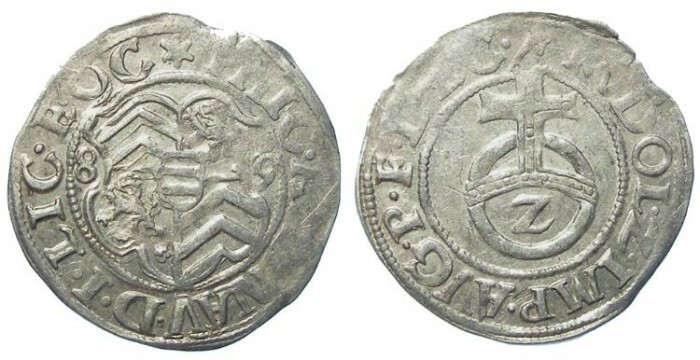 Anonymous city coin after AD 1474. Silver Weissphenning.